I saw Baz Lurhmann’s The Great Gatsby the other night. Part of me wants to launch into a great tirade and say he defecated glitter all over one of my favourite books…but the truth is, he’s a wonderful auteur and I knew what I was getting myself into. Baz’s Gatsby is not my Gatsby, but it’s a rather beautiful film nonetheless. My version of Gatsby was never, ever, remotely camp: definitely decadent, hedonistic in parts, but never camp. I read the novel at high school, then again at university and while my recollections are faded, I remember the prose as spare, the tone wistful. I’ll read The Great Gatsby again soon I imagine, as an adult. There aren’t too many broken dreams for me at the moment; the green light is still flashing on the horizon. But I was reflecting after the film and I realised that one of my green lights has fallen away, only to give way to others. You see, I wanted a daughter in a truly irrational way. As a woman with great relationships with her own mother and grandmother, I saw my imagined daughter as an integral part in my future life. I won’t bore you with the psychoanalysis and flawed thinking, but I’m embarrassed to say that I grieved a little bit when the dream faded to black; when I realized that I didn’t want any more children. 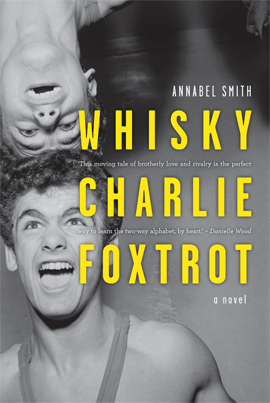 This is where I’ll segue to the subject matter I intended to write about this morning: I didn’t come here to talk about Gatsby; I wanted to write some thoughts on boys, wonderful boys, after reading Annabel Smith’s most recent novel, Whisky Charlie Foxtrot. You see, I have met some lovely Perth writers recently and I’m keen to read their work. Annabel has also kindly offered to mentor me in a two hour session next week. I’m most excited (and of course, a little terrified!). I want to be plain: I will always write my genuine thoughts on a text; I won’t mince my words. I grew up in Perth in the eighties and Whisky Charlie Foxtrot is set in a familiar place: there are the requisite walkie-talkies and Scaletrix; the recognizable playground chatter. The narrative revolves around the relationship between two brothers, identical twins, Charlie and William (aka Whisky) Fern. I have two sons so I’m very invested in the themes explored in the novel. My personal sense of nostalgia and interest in boys and ‘boyhood’ meant that I was hooked pretty quickly. I’m always delighted by books in which my sympathies shift; where the unreliable nature of any narration comes to the fore. I’m reminded of a line from Elemental by Amanda Curtin (I can’t check it because my grandmother is reading it now! ), ‘there’s no one can tell a story true.’ Charlie is flawed, but I developed a deep affection for him and his loved ones. It was a sad goodbye as I turned the final page. I learnt something that bothered me in this novel; the term ‘puerile’ comes from the latin word puer, meaning ‘boy’. What is striking, of course, is the word’s negative connotations within our current vernacular. Think: Slugs and snails and puppy dogs tails. Like exclamation marks and instant coffee, poor children of the male variety get a seriously bad rap. Now, I have a lot to do with young boys aged between three and ten. Honestly, I am surrounded by them; my mothers’ group produced only boys- first, second and third generation. That’s twelve boys- we could probably go off the grid or provide power for Synergy. I work at a Language Development Centre where boys are our main clientele. I have an older brother who tormented me with his puerile behaviour during our youth (we’re great friends now). I can say, hand on heart: boys are different. By god, they are different to girls. But they are different, not worse. Obviously, there is a spectrum- from your most puerile (and by that, I’ll go with the current understanding of the term: immature, foolish) to more restrained or effeminate boys, but anyone who wants to launch into a nature/nurture debate, please, come and spend a day in my classroom. Sometimes women find boys difficult to manage; hard to understand. But boys are wonderful. They can be energetic and boisterous but equally thoughtful and kind. Their sense of humour tends towards the gross but sometimes their jokes are so sophisticated that they have me laughing out loud. They sometimes show they love each other with jibes and endearing name calling (if you can call ‘Snot Face’ a term of endearment- there’s rarely any offence taken); sometimes they cuddle and kiss and declare their enduring love for one another. They wrestle and nearly kill each other; they sometimes show off, they occasionally lash out in a retaliatory moment of rage at some perceived injustice…I could write a whole blog post entitled, ‘In Defence of the Boy Child’, but I won’t, I promise. You’re wise folk out there; you know about boys. You see, as mothers and fathers, we have to learn pretty quickly that we can’t pin our hopes and dreams on our children. We have to recognise that they have their own ‘green lights’ and we have to respect them. My two boys have very different temperaments and I have learnt that there are things I cannot change; that no amount of behaviour modification is going to sedate an exuberant personality or make an extrovert an introvert (or vice-versa). And why on earth would anyone want to? Human nature and ego, that’s why. But, as in Whisky Charlie Foxtrot, parents have to learn an important lesson: we have to let our children be who they are, or there will be inevitable ramifications. I read this novel in two sittings and it would have been one if I hadn’t started at 11pm on the first night. There are so many astute and quaint observations about sibling rivalry, jealousy, parenting and love in this novel. I’m going to end on something that made me smile: I felt immediate recognition during the ballroom dancing scenes; like me, the girls of Smith’s book were probably raised on a steady diet of Dirty Dancing and Grease, and have thus developed a liking for guys of Swayze and Travolta’s ilk who have ‘the moves like Jagger’. Go Charlie Fern with your fabulous foxtrot! A very thoughtful, eloquent piece Kristen. Once upon a time I would have been tempted to fire up on the nature/nurture debate on reading this, but I have latterly come to realise that I did so to defend what I imagined myself to be, as opposed to what I thought other males were or could be. And my opinions on all of these are hardly free from inaccuracies and biases anyway. Indeed, nobody can tell a story true. I read Whisky Charlie Foxtrot earlier in the year and thoroughly enjoyed it. I’ve almost finished Elemental, so I’ll read what you said about it when I have. I would have fired up about the gender debate a few years ago too. It’s anecdotal evidence of course; I’m no scientist…developing a proper understanding of scientific method is high on my bucket list. Oh, to have time and money for such pursuits! Anyway, it doesn’t really matter whether our boys are conditioned or biologically primed for certain weird and wonderful behaviours- in my mind, they’re a different beast, and, as a teacher, they require different behaviour management/ rapport building techniques. My grandmother is half-way through Elemental and she just sent me a gushing text about the quality of the writing. I hope you enjoy it! Thanks for this thoughtful and stimulating response to my book Kristen – though I must admit I was so arrested by the phrase ‘defecating glitter’ that i could barely read on! I am yet to see Gatsby, and despite the many negative reviews I’ve read, I can’t wait. I too read it at school and at uni and am ready for an grown-up re-read. We’ll confer!